This book arises out of a recognition that student affairs professionals have little preparation or guidance in dealing with matters of spirituality, religion, secularity, and interfaith work at a time of greater diversity in students’ beliefs and, from a broad recognition that there is a need to engage with this aspect of student life. For those who don’t know how to begin and may be nervous about tackling a topic that has the potential to lead to heated disagreements, this book provides the resources and practical guidance to undertake this work. With the aim of providing student affairs practitioners and faculty with the tools they need to increase their comfort level and enable their ability to engage in discussions about belief both in and out of the classroom, the contributors provide foundational knowledge, concrete teaching ideas, sample activities, and case studies that can be used in a variety of settings. 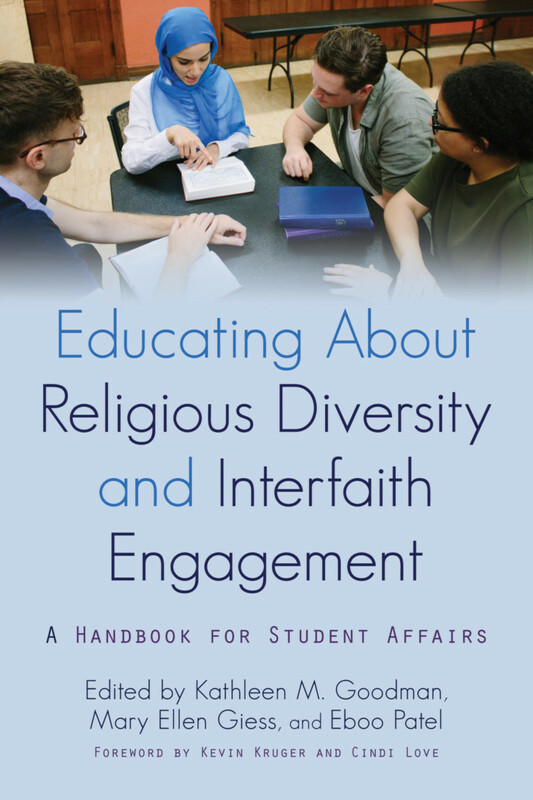 This book serves multiple audiences in student affairs by providing teaching ideas for practitioners who want to include a session or two about interfaith in their programs as well as ideas for student affairs faculty who may be teaching one session on this topic or a whole course. The book is divided into four sections. The first offers context, provides the findings of research, and asks readers to reflect on the framework they use to embark on this work, whether a social justice framework that aims to highlight issues of power and privilege or an interfaith cooperation framework that aims to create religious pluralism. Part Two provides concrete ideas for creating courses, activities, events, and programs focused on spirituality, religion, secularity, and interfaith engagement, as well as ideas for incorporating these topics into courses typically offered in student affairs preparation programs. Part Three presents case studies to engage students, practitioners, and faculty in thinking about campus situations related to religious diversity. Part Four provides some basic information about a variety of religions and worldviews held by college students. “While we have increased our emphasis on racial and gender identity over the past twenty years, higher education has not had a commensurate effort to create a deeper understanding of the important role college years play in student’s religious, secular, and spiritual identity. "If you dream about humanity bending toward justice, or relationships that nurture peace and even love, you understand that religious, secular, and spiritual diversity education is a critical frontier for higher education. History has taught us that college campuses are catalysts for movements of inclusion and human transformation—and Goodman, Giess, Patel and colleagues implore us to design learning environments that champion interfaith engagement to this end. A treasure of pedagogically sound and practical wisdom awaits. I could not stop reading." "The editors of this volume have produced a timely, thoughtful, and responsible effort that locates the importance of excellent interfaith practice within the good work of Student Affairs. Offering examples of effective co-curricular pedagogical tools -- programs, activities, events and case studies – designed to help students engage in productive exchange across worldview differences, the editors have provided an invaluable resource for institutional stakeholders specifically interested in inclusive interfaith engagement." "The writers in this volume bravely and empathetically address the fascinating religious and secular diversity on college campuses. Unlike those wishing to use the student affairs profession to advance a narrow moral agenda, these writers lead the way in showing respect, justice and honor to the breadth of humanity in our universities. If read sympathetically and used wisely, their insights and advice can lead us to a deeper understanding of and love for each other." Patty Perillo, Vice President for Student Affairs and Assistant Professor of Higher Education, Virginia Tech; Past President of ACPA-College Student Educators International - . Kathleen M. Goodman is an Assistant Professor of Student Affairs in Higher Education, Miami University. Mary Ellen Giess is the Senior Director of Co-Curricular Partnerships, Interfaith Youth Core. Eboo Patel is the Founder and President, Interfaith Youth Core.